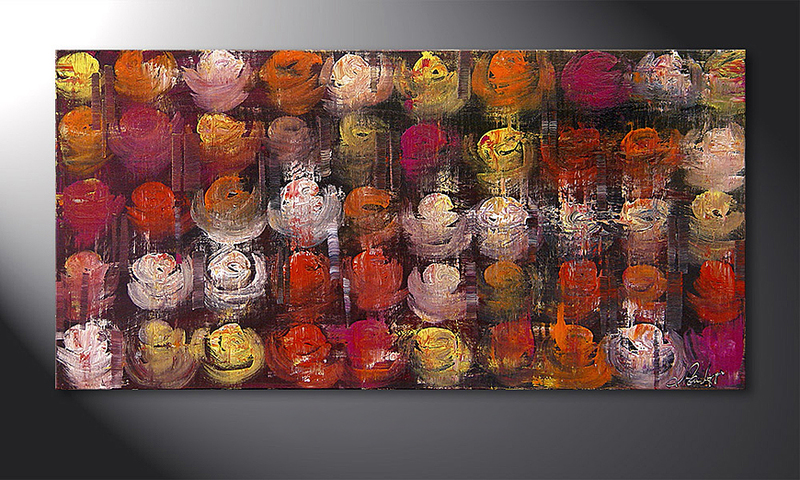 This wall picture Hand-painted painting "Colored Roses" 120x60cm is a hand painted, not an art print. It consists of one panel with a width of 120 cm. Purple, Red, Orange, Yellow are the main colours of this picture. The Potsdam based artist Luise Zantopp is a co-owner of Paintings XXL. Antje Rose - which is her original name- respectfully adopted her great grandmother's name which thereby lives on through her work as an artist. Luise convinces with an adventurous, diversified, and colourful approach to painting. She utilizes a wide variety of painting techniques she has acquired over the course of time through her eagerness to experiment and through hard exercise. Having an eye for small details is one her her big strengths with which she refines all of her paintings. Natural and city motives belong to her most valued work and have acquired an immense popularity among our customers.